AZUSA >> The life of a 19-year-old El Monte man was suddenly and senselessly cut short early Saturday after an allegedly intoxicated wrong-way driver plowed into his car at high speed on the 210 Freeway in Azusa, according to authorities and family members of the victim. The fatal collision took place about 3:10 a.m. on the westbound 210 Freeway at Vernon Avenue, California Highway Patrol Officer Monica Posada said. Justin Romo, 19, was killed in the crash, Los Angeles County Department of Coroner Lt. David Smith said. Romo’s 1992 Nissan 240SX was struck head-on by the suspect’s 1997 Honda accord with a combined speed of 150 mph, CHP officials said. Romo’s girlfriend, 16, was riding as his passenger and was hospitalized with injuries described as moderate, officials and Romo’s mother, Lupe Garcia, said. The driver of the Honda, 24-year-old Tyler White Thompson, ran from the wreck but was arrested a short time later at his home in Duarte, according to CHP officials and Los Angeles County booking records. He was treated for apparently minor injuries and booked on suspicion of intoxicated driving and hit-and-run, Posada said. Officials were also seeking a second “person of interest” in connection with the crash, Posada said, however that person’s role in the incident was not clear. No description of the person of interest was available. Officials first received a call at 3:08 a.m. reporting a wrong-way driver headed eastbound in the westbound lanes of the 210 Freeway near Irwindale Avenue in Irwindale, less than a mile west of the crash scene, CHP Acting Sergeant Ron Warrior said in a written statement. Both vehicles were travelling about an estimated 75 mph when the collided, officials said. Romo, who had been driving in the left-hand lane, swerved in an attempt to avoid the oncoming Honda, but was unable to avoid a collision. “As (the Honda) approached (the Nissan), (the Nissan) swerved to the left and a head-on collision occurred between the two vehicles,” Warrior said. Romo succumbed to his injuries at the scene, officials said. His teenage passenger was taken to Los Angeles County-USC Medical Center for treatment. Her injuries were not believed to be life-threatening. A Sig Alert remained in effect for all westbound lanes of the 210 Freeway at Vernon Avenue for more than four hours, Posada said. Officers from the Baldwin Park office of the CHP are investigating the crash. Thompson was being held in lieu of $1 million bail at the Inmate Reception Center in Los Angeles pending his initial court appearance, according to booking records. Romo’s mother said she hoped the wrong-way, allegedly DUI driver is charged with manslaughter. In addition to herself, Garcia said her son is survived by three older sisters: Janel Garcia, Adriel Garcia and Marlene Garcia. “He was their baby brother,” the mother said. Romo is also survived by his step-father Michael Garcia, who has raised him from birth, and his biological father Arthur Romo. Romo was caravanning along with friends in other cars after spending some time up in the Azusa Canyon, Garcia said. Several of his friends witnessed the crash. 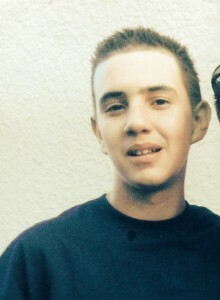 Romo, a lifelong El Monte resident, attended El Monte High School and El Monte Union High School Community Day Program alternative school, his mother said. He was a very active young man who loved skateboarding and BMX biking, she added. He often spent time at the Bonita Skatepark in Arcadia, which is where he met his girlfriend, Garcia said. “That was his second home,” she said. Garcia said her son was looking for a job and hoping to attend school to study auto mechanics. The grieving mother said she hoped others would learn from her family’s tragedy and never get behind the wheel while intoxicated. Donations to benefit Romo’s family can be made at any Chase bank to account number 621355937. Saturday’s crash was the third fatal head-on freeway collision suspected to involve DUI in the area over the past six months. A La Habra man headed the wrong-way on the 210 Freeway in Rancho Cucamonga struck another car on July 20, killing two of four family members inside, CHP officials said. Officials were looking into the possibility that the wrong-way driver, Mack A. Jaramillo of La Habra, was intoxicated at the time of the 2 a.m. crash. Another wrong-way crash alleged to involve drunken driving left six people dead in Diamond Bar on Feb. 9. Olivia Culbreath, 21, of Fontana has been charged with six counts of murder in connection with the horrific crash, which CHP investigators blamed on drunken driving. Two of those killed were passengers in Culbreath’s Camaro, officials said, while the other for were travelling in the Ford Explorer she struck head-on. PHOTO of Jusin Romo, 19, of El Monte courtesy of family. This entry was posted in Azusa, DUI by Brian Day. Bookmark the permalink.